Spring is here, the sky is blue and sun is shining! 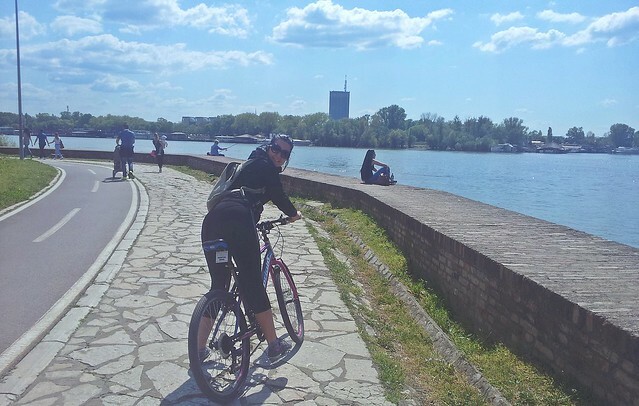 What better way to spend your time in Belgrade than rent a bike and take a cycling tour next to the river Sava. There are 6 bridges on the Sava in Belgrade, and you will ride a bike under all of them. So if you are coming from city center, you can take the following buses: 23, 37, 51, 52, 53, 58. The bus stop is called Ada Ciganlija, and it is impossible to miss it, as you will see the lake, boats and crowds of people approaching Ada. Bike rental places are at the very entrance. The price for an hour is 200 RSD, and it will take you an hour to finish this tour if you take a faster pace, and maybe an hour and a half if you like riding your bike slowly. Instead of taking a regular route around Ada, take the cycling road leading to the city (you are now returning to the bus stop where you got off the bus). Now you just have to follow the road! First, you will see the newest Sava bridge, called simply “Bridge over Ada”. 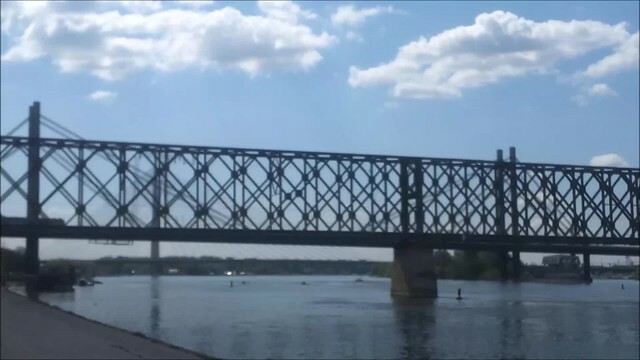 Next one is the Old Railway Bridge, then you will see Gazela, the huge red bridge which is today one of the most used bridges in Belgrade. While cycling here, you will be passing first next to barges and kafanas, and then there will be an old industrial zone, with old and abandoned industrial ships. 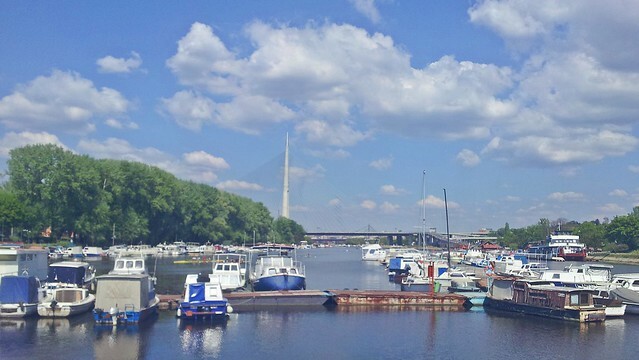 The river will be very close to you – and you will see New Belgrade on your left, almost at hand. Tram bridge is the green one, and then you are entering the urban part of the route. Then there is Branko’s Bridge with bike elevator – you can lift up the Bridge and cycle to New Belgrade. Here is the fancy “Beton hala” with many expensive restaurants – you will see dressed up people here even if it is only for a coffee and in the middle of the day. Wave to them and continue your tour! Next you are under Belgrade fortress Kalemegdan, and you are seeing the famous statue of the Winner from a completely different perspective. You will have the chance to see the whole fortress from beneath. 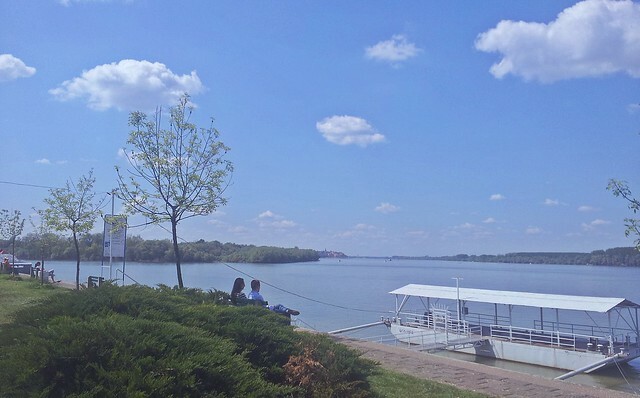 At one point, you will be passing by the confluence of Sava and Danube. Stop by and feel the energy! Now you are entering the zone of 25. Maj – this is a sports and recreation center. People come here to walk by the river, so watch out not to hit someone, because they love walking down the bike path. The end of the route is close now, so be prepared to turn around and cycle your way back to Ada! 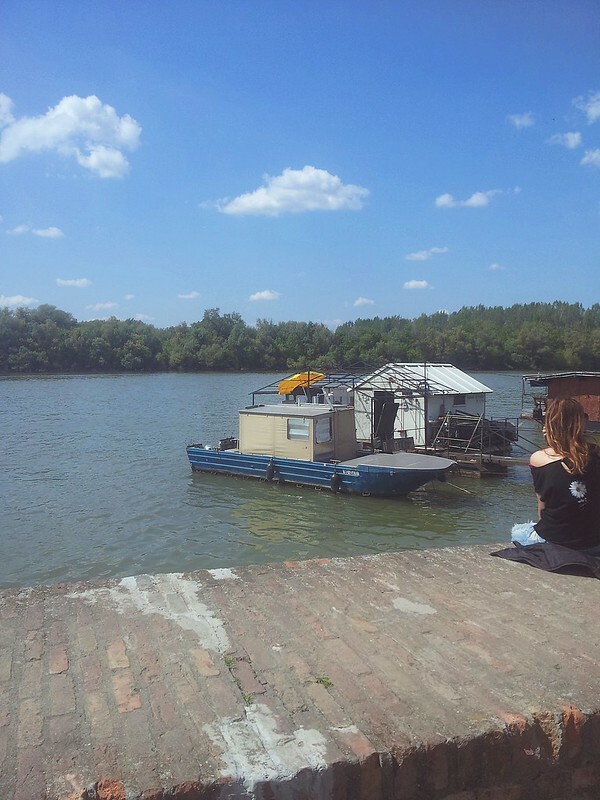 We recommend stopping by and drinking beer or coffee at the barge “Brodić”, located just before the Ada bridge.